The Purser's Bell is handmade of solid sand cast brass that has a bronze finish and includes a chunky hand knotted lanyard. 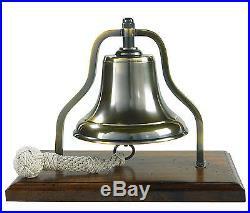 The bell is mounted on a wooden stand that has a French distressed antiqued brown finish. 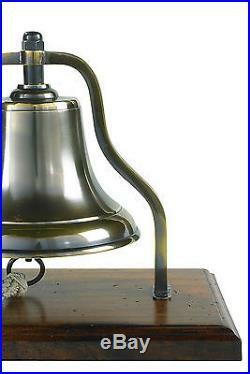 This is a Loud bell which is sure to be heard throughout the house! Size: 6" x 9.5" x 7.75, Material: Solid Brass, Finish: Bronze, Construction: Handmade sand cast brass, Stand's finish: French distressed antiqued brown finish, Includes: Hand braided & knotted lanyard. Purser's Bell Bronze Antiqued Finish Authentic Models. 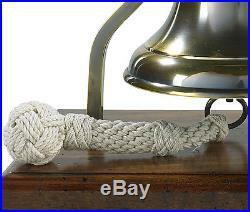 Nautical Brass Ships Purser's Bell Bronze Finish 9.5. Size: 6" x 9.5" x 7.75. Construction: Handmade sand cast brass. Stand's finish: French distressed antiqued brown finish. Includes: Hand braided & knotted lanyard. Unlike civil clock bells, the strikes of the bell do not accord to the number of the hour. Instead, there are eight bells, one for each half-hour of a four-hour watch. Bells would be struck every half-hour, and in a pattern of pairs for easier counting, with any odd bells at the end of the sequence. After that the item will be re listed. Models & furniture are securely packed with foam sheets, peanuts or bubble wraps. For other reasons please contact me to get a return authorization. This item was in stock at the time of listing. This will assure that your message will be received. 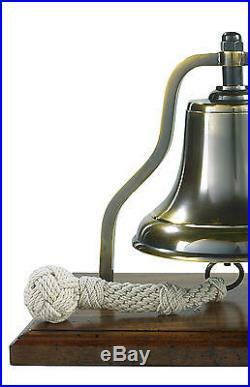 The item "Nautical Brass Ship's Purser's Bell Bronze Antiqued Finish 9.5 New" is in sale since Tuesday, July 28, 2015. This item is in the category "Collectibles\Decorative Collectibles\Bells\Metal".jimscar-go" and is located in Eugene, Oregon. This item can be shipped to United States. Size: 6" x 9.5" x 7.75"